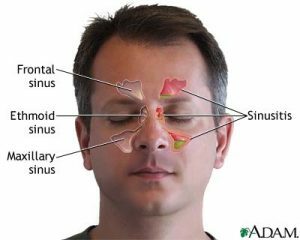 Sinusitis refers to inflammation of the sinus cavities, which are moist, hollow spaces in the bones of the skull. If the opening from a sinus cavity becomes plugged, the flow of mucus is blocked and pressure builds up, causing pain and inflammation. Fast Times at Ridgemont High was required viewing for the 80’s surfer. Sean Penn’s depiction of Jeff Spicoli set the high (or low) watermark for countless dawn patrollers of the decade. Both surfing and Sean Penn progressed but the 1982 movie offers an example of a current surf disease. Remember Spicoli’s high nasal voice, “No shirt, no shoes, no dice!”? This is a sign of the medical condition, ‘Surfer’s Sinusitis’. Surfer’s Sinusitis is inadequately described in the medical literature. Your complaints of frontal sinus pressure, post nasal drip, productive coughs, and a Jeff Spicoli’s nasal voice may puzzle your land-locked doc. 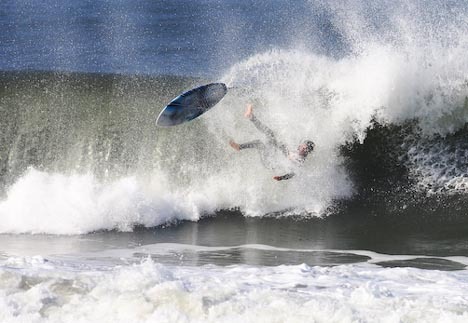 One recent question posed by a reader to the surf magazine Carve tearfully described how his physician told him to stop surfing because of his recurrent sinusitis. The magazine editor recommended referral to an Ear, Nose and Throat specialist, which is excellent advice. Maybe this column can save you the trip. meeting with the boss, while sitting in class, the cusp of romance? Thank your nasal sinuses for accumulating a little ocean with each wave. That river from your nose is embarrassing enough but there are a number of other health concerns, especially when you consider the high levels of pollution in the water. Do you have a low grade, frontal pressure that can turn into a headache as the day progresses? Your Paranasal sinuses are filled with salt water. Has that productive cough lasted for weeks? When you sleep, instead of draining out your nose the ocean water will drain back down your throat and into your lungs. This drainage can lead to bronchitis and even pneumonia. There is a more serious health concern related to Surfer’s Sinusitis, which is the entry of bacteria into your body. In January of 2001 a patient presented to my hospital with mental status changes. His pregnant wife stated he was acting strangely and when I examined him he could barely answer my questions. This patient complained of a severe headache, nausea, vomiting and a fever. During the exam he lapsed into a coma. I remember him well in part because his brother told me he surfed the frequently polluted waters of Malibu everyday. A CT of the head noted a large frontal mass consistent with a cerebral infection. His situation could have required emergent removal of his skull to decompress the pressure on his brain. Long story short he responded well to the antibiotics and after months of rehab, surfed another day. You may have heard about the surfer, Timmy Turner. His many successes include the 2004 Surfer Magazine Video of the Year. Mr. Turner acquired a Staphylococcus infection, which led to a CNS infection and cerebral swelling. The infection nearly took Mr. Turner’s life, although after multiple surgeries and a long recovery he recently presented at the 2006 Surfer Award ceremony. My understanding of his case is that the route of entry for the Staphylococcus infection was uncertain; the Paranasal sinuses could be the source. Looks like a case of sinusitis and a potential vasectomy! So what can you do? Make friends with your doctor, maybe print this article out and ask her if your symptoms fit Surfer’s Sinusitis. Maybe ask for a referral to an Ear, Nose, and Throat specialist. You can also try a few of my tricks. The first is to be aware of the previous symptoms and after a day filled with a face plants or a number of duck dives take generic, over-the-counter Sudafed 10mg as directed (which is up to every 4 hours). Twice a day works for me. Ibuprofen 600mg will help with the headache. 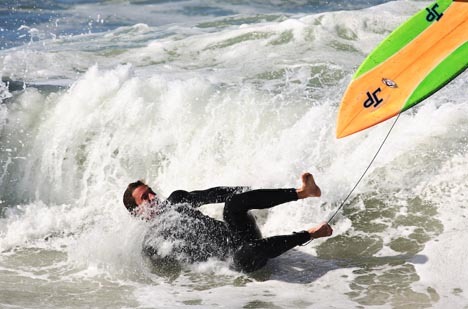 There are a couple more tricks for surfers who are miserable because of Surfer’s Sinusitis. Their sinusitis is more severe and frequently requires antibiotics. If this is you, discuss with your doctor your recurrent sinusitis and request a few refills of antibiotics so you can initiate treatment at the onset of your symptoms. This way you can shorten the infection and avoid the complications. And lastly, you could also wear a nose clip. Yep I wear one of these ‘Kook clips’. They are officially called by swimmers ‘competition nose clips’. I bought mine for $3.00 at swimthings.com but shop around and find the cheapest site. Purchase a few because the shipping will cost as much as the clip. Tie down the clip to your rash guard or wet suit with 6lb test fishing line. Without question wearing a nose clip decrease the episodes of Surfer’s Sinusitis. We will discuss how to deal with the taunts in another column. Email Dr. Jude with your questions.